In cattle, the most frequently reported signs of fescue toxicosis are associated with vasoconstriction (blood vessel constriction). This can result in cattle overheating in the summer because they cannot dissipate heat effectively and sometimes causes signs of gangrene in the winter due to insufficient blood flow to the hooves or tail switch. Fescue toxicosis in cattle is also associated with low average daily gain, poor growth rates, and lowered fertility. Reports in the literature of whether grazing endophyte-infected fescue can cause poor growth rates or reduced performance or fertility rates in horses are inconsistent, and researchers have not investigated the mechanisms that might contribute to these effects. Therefore, several years ago, the laboratory of Karen McDowell, PhD, associate professor at the University of Kentucky Gluck Equine Research Center, performed some experiments to determine if endophyte-infected fescue caused vasoconstriction in horses, similar to cattle. McDowell, along with Laurie Lawrence, PhD, professor in UK's Department of Animal and Food Sciences, fed horses ground fescue seed containing either fescue seed containing ergovaline and associated alkaloids or alkaloid-free fescue seed. They used Doppler ultrasonography to measure blood flow in, and the diameter of, the palmar artery in each horse's left foreleg, just above the fetlock joint. They found significant artery constriction in animals consuming alkaloid-infected fescue seed but not in animals consuming alkaloid-free seed (Figure 1). This was the first known report of endophyte-infected fescue causing vasoconstriction in horses consuming it, and the results appeared in the Journal of Animal Science (J. Anim. Sci. 2013. 92:1677. doi:10.2527/jas2012-5852). This spring, McDowell, along with Glen Aiken, PhD, from the USDA Forage Animal Production Unit located on UK's campus, and Michael Barrett, PhD, and Tim Phillips, PhD, both from UK's Department of Plant and Soil Sciences, will examine vasoconstriction and pregnancy outcomes in pregnant mares grazing fescue grass containing a novel endophyte. 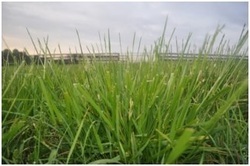 This grass produces alkaloids that give the grass the same competitive advantage over other forage grasses, but without the harmful alkaloids. Although endophyte-infected fescue's deleterious health effects in mares have previously only been associated with problems in late gestation, this recent work demonstrates that endophyte-infected fescue can cause vasoconstriction in the legs and reduced blood flow to reproductive organs in mares. Researchers have yet to determine these effects' significance on growth, performance, fertility, or other physiological parameters. However, McDowell believes the use of Doppler ultrasonography to monitor palmar artery diameter in horses grazing endophyte-infected tall fescue pastures might provide a convenient and noninvasive biomarker to determine premonitory signs of fescue toxicosis, and she is continuing work in this area. Karen J. McDowell, MS, PhD, a researcher at the UK Gluck Equine Research Center, provided this information.